Today's project is something I made to take to my new job - using those fab Scribby Birds by Dina Wakley again. I just made a stamped panel to cover a shop notebook - challenging for me because it's almost completely flat except for the layered birds. I usually like layers and dimension but it's not practical with something like this that's to be used. This is VERY not me but after my vintage effort went in the bin I decided to just have a bit of fun. After stamping the Tim Holtz greeting in three Distress colours I added splats of various spray inks using a pipette (OMG it's messy - do this in a box!!!). I then stamped a Donna Downey foam stamp with Distress Inks before adding the watercoloured birds and finishing with a Remnant Rub. I think this will brighten my day at work! 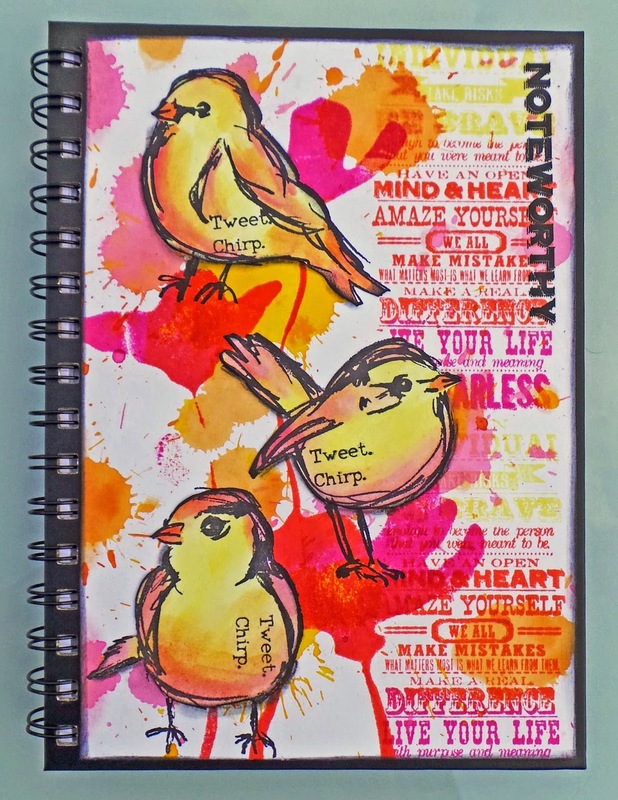 Entering this for the That's Crafty - The Birds Challenge! This is beautiful Katy! Good luck in your new job & thanks for joining us at That's Crafty. I think it's brilliant. Thanks for entering it in the That's Crafty! challenge. Really love this page. Fantastic!